"In a sharp curve of a muddy Monroe County back road some seven miles west of Amory stands a padlocked gate. On the other side of this gate a long row of oaks leads down to the Tombigbee riverbank where traces of the ferry landing can still be seen. A few hundred yards south stand great concrete pillars supporting thin air. "Among the tangled brush is a long forgotten cemetery and somewhere beneath the thick grass are traces, foundations, and cornerstones of a once thriving riverport and trade center. The row of oaks once lined the major street of Cotton Gin Port, the oldest town in northeast Mississippi, now only a fading memory." (Sharon Walls, Summer 1977). Cotton Gin Port is an abandoned town on the upper Tombigbee River in Monroe County Mississippi. It was located at the spot on the muddy Tombigbee at a high point of navigation, at the intersection of Chickasaw trading paths, and it was one of the first white settlements in North Mississippi. All that is left of the abandoned townsite is the Mississippi State Historical Division historical marker on Highway 278. Although Cotton Gin Port re-emerges as a focal of interest every so often, I was of the impression that it had pretty much been forgotten after a 1971 attempt to get it on the National Register of Historic Places failed. The Mississippi Historical Society published Cotton Gin Port: A Frontier Settlement on the Upper Tombigbee, by Jack D. Elliott, Jr., and Mary Ann Wells in 2003. Read about the book in the Mississippi History Newsletter, August 2003. There are a lot of historical facts known about Cotton Gin Port. The ferry was in operation by 1803. Gaines Trace was opened as a road connecting Cotton Gin Port on the Tombigbee to Colbert’s Ferry on the Tennessee in 1810, surveyed along an old Chickasaw trail. The town was incorporated by the Mississippi Legislature in 1838 and reached its height around 1848, at which time it had a carding factory, a flour mill, twenty stores, and a population of approximately five hundred. The flood of 1847-48 damaged the town, and it never really recovered. Cotton Gin Port died in 1887 when the Kansas City, Memphis and Birmingham railroad laid its tracks three miles east and proceeded to sell lots for its new planned town of Amory. In 1971, the Mississippi Department of Archives and History submitted a nomination form to have the “Cotton Gin Port Site” listed on the National Register of Historic Places. These are verifiable facts, and these alone would make Cotton Gin Port an important historical site. It was one of the oldest, if not the oldest, white settlements in North Mississippi. It was a trading post with the Chickasaws. It was a contender for county seat when Monroe County formed in 1821. It was a seat of justice, a post office, and a stage and wagon hub. But the legends about the Cotton Gin Port site are even more interesting and give to the place a sense of deep mystery. The legends surrounding the Cotton Gin Port site extend back into the mists of time and the legends, as much as the history, gives us a sense of place, deeply rooted in the experience of the people of Monroe County. These legends reveal much about the people of the place, and the way that this particular place, in history and in geography, informed their lives. These are the “personal histories” of the people of Monroe County, the local historians, the storytellers. A sense of place infuses the story of Cotton Gin Port. It is such a specific geographical place, and its geography shaped its history and its legends. 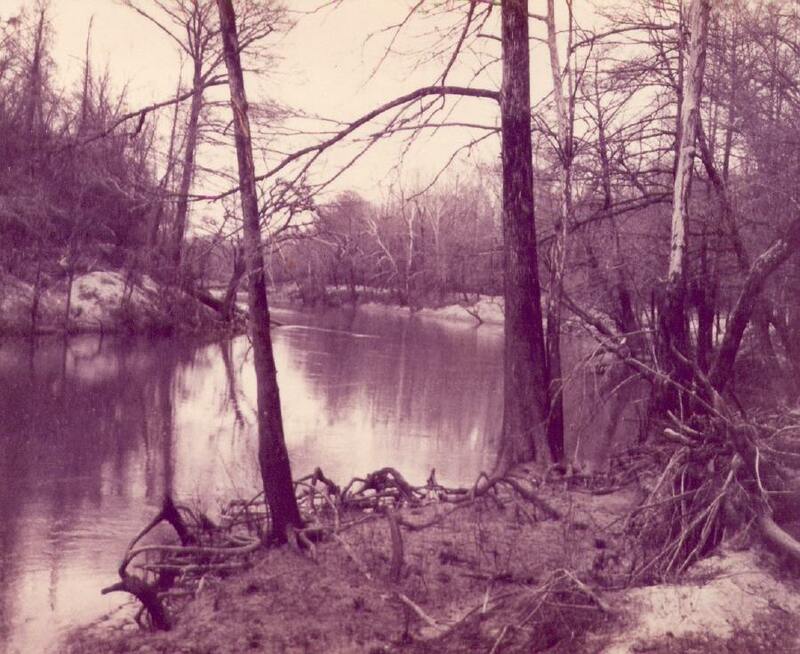 It was the highest navigational point on the upper Tombigbee, except at certain times of high water when a steamboat might reach to Camargo, another abandoned town fallen to the railroad, on Town Creek. This geographic characteristic shaped the economic destiny of this place: it was a river port for flatboats and then for steamboats shipping goods down the river to Mobile. When the railroad eliminated that need, the port ceased to exist. It was a point where it was apparently easy to cross the Tombigbee River, since several Indian trails did that and it became a ferry, a point on Gaines Trace which was surveyed for the United States government, and a one-lane iron bridge. It was a place sacred and practical to the Chickasaws. They had a village on the bluff west of Cotton Gin Port. They had a mound in the floodplain west of the river. The United States government built the cotton gin here to please them. Tecumseh came here to persuade them to fight the Americans. Bell Mission School was founded here to reach them. So the geography of the place infused it with meaning. The geography shaped the use of the place, shaped its settlement patterns, and shaped its economy. The history of Monroe County, one of the largest in the state of Mississippi, is kept alive through her people. Everyone is a local historian, a storyteller, a keeper of tradition and legend. Although the Advertiser printed hundreds of extra copies of the original tabloid newspaper section, they could not keep enough copies on hand, and decided to print a more permanent edition in a hard-bound book. The contributors to the special edition were usually local historians. Every little community in the county contributed something, and the stories presented were anecdotal. They wrote about their communities, the businesses, the schools and the churches, both black and white. Cotton Gin Port played a supporting role in Miss Lucille Rogers’ piece, “Amory was Mississippi’s First Planned City.” The first third of her story honors Cotton Gin Port and the article opens with, “Amory has a unique and rich history. Its history is inextricably linked with that of historic Cotton Gin Port, the first White settlement in North Mississippi.” Thus, the first sentences of the collection of articles links back to Cotton Gin Port. The article on Cotton Gin Port separately that appears in this collection is a reprint of one written by Dr. W. A. Evans, an amateur local historian who made some wonderful contributions to Monroe County historical efforts. William Augustus Evans was born in 1865 in Marion, Alabama, but moved with his family to Aberdeen, Mississippi as a young boy. His father was a doctor, and also a planter who owned quite a bit of property west of Aberdeen in addition to one of the great antebellum homes that line High Street. Evans was a member of the first graduating class of Mississippi A & M (now Mississippi State). He became a doctor, practicing public health in Chicago. He became Chicago health commissioner, pioneered pure water and milk laws there, and wrote the first syndicated health column in the United States called “How to Keep Well” in the early 1900s. He retired to Aberdeen in the early 1930s and took up the practice of local history. He gave the city of Aberdeen Evans Memorial Library. He prevailed upon the editor of the Aberdeen Examiner to reprint a series of letters that had been published in an early Aberdeen weekly newspaper in 1877 – 1879 called “Pioneer Times in Monroe County.” These early letters had been written by another retired amateur local historian, W. B. Wilkes and give lively descriptions of life in a young Monroe County. These letters were reprinted in the Aberdeen Examiner in 1936, 1937, and 1938. Evans contributed “a series of historical sketches of Monroe County” called “Mother Monroe.” These short articles, the first of which described and explained W. B. Wilkes’ “Pioneer Times” letters, covered the communities, people, and places of Monroe County and many of them were subtitled “Some Facts and Some Probable Facts.” This series also ran in the Aberdeen Examiner during 1936, 1937, and 1938, along with a series on “Who’s Who in Monroe County Cemeteries” for which Evans recruited Boy Scouts to help him find and transcribe the tombstones in the cemeteries in Monroe County. Evans began his narratives in 1821, the year Monroe County was organized by the state legislature although not very organized on the ground. In 1821, the Chickasaw Indians still occupied the lands west of the Tombigbee River, and that was a large portion of the present day county.